Today is International Children’s Book Day and it is a (throwback) Thursday, so I thought I would mark the occasion with a post about a book I read as a child. 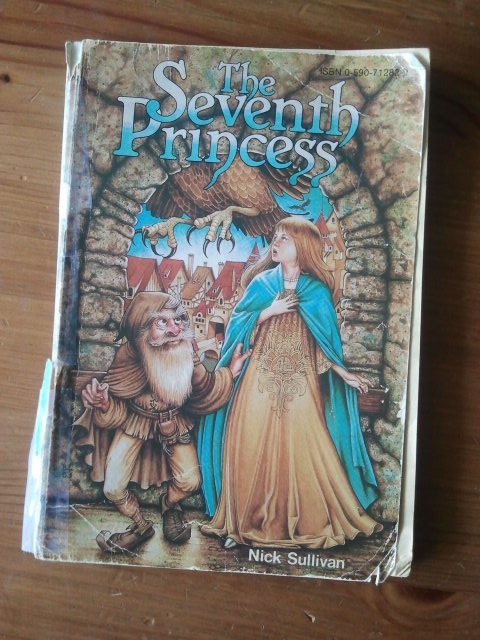 I bought The Seventh Princess by Nick Sullivan at a Scholastic book fair at my elementary school. Do you remember having book fairs at your school? I loved them. All the books lined up on tables. Getting a little money from my parents to pick out a book for myself. It was so exciting. I’ve kept it all these years because of the memory of getting to buy it for myself and for the pleasure of the story. The Seventh Princess tells the story of Jennifer, a young girl who is transported off her school bus to a strange land where everyone thinks she is a princess. But, as Jennifer learns, being a princess in this place is no fairy tale and she will soon be turned into a harpy, doomed to do the bidding of the powerful sorceress Swenhild. With the help of some new friends, Jennifer must break the spell and free the kingdom and the princesses from Swenhild’s grasp. I was really into fantasy at the time and I loved the cover – I still do, something about the blue of her cloak and the town in the background. So The Seventh Princess still sits on my shelf, waiting for my kids to get old enough to enjoy it. Do you have any books that you’ve held on to from your childhood? I read this book as a child and loved it. I still have a copy of Lowry’s The Giver at home that I have kept all these years. Yes, The Giver is a good read. I have it thanks to a children’s lit class. Did you see the movie? I heard it wasn’t as good as the book, but few movie adaptations are of course.